He gained the title of 1st Baron Romilly. From 22 October 1833, her married name became Romilly. [S6] G.E. Cokayne; with Vicary Gibbs, H.A. Doubleday, Geoffrey H. White, Duncan Warrand and Lord Howard de Walden, editors, The Complete Peerage of England, Scotland, Ireland, Great Britain and the United Kingdom, Extant, Extinct or Dormant, new ed., 13 volumes in 14 (1910-1959; reprint in 6 volumes, Gloucester, U.K.: Alan Sutton Publishing, 2000), volume II, page 113. Hereinafter cited as The Complete Peerage. [S8088] Vincent Viot, "re: Otter Family," e-mail message to Darryl Roger LUNDY (101053), 17 September 2016. Hereinafter cited as "re: Otter Family." 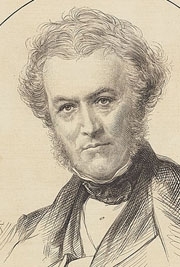 Edward Romilly was born in 1804. He was the son of Sir Samuel Romilly and Anne Garbett. He married Sophia Marcet, daughter of Alexander John Gaspard Marcet, on 7 May 1830. He died on 12 October 1870. Sophia Marcet was the daughter of Alexander John Gaspard Marcet. She married Edward Romilly, son of Sir Samuel Romilly and Anne Garbett, on 7 May 1830. She died on 27 July 1877. Her married name became Romilly. Henry Romilly was born on 31 December 1804. He was the son of Sir Samuel Romilly and Anne Garbett. He married Rosa Morris, daughter of James Pemberton Morris, on 15 May 1850. He died on 25 December 1884 at age 79. Rosa Morris was the daughter of James Pemberton Morris. She married Henry Romilly, son of Sir Samuel Romilly and Anne Garbett, on 15 May 1850. She died on 20 April 1892.